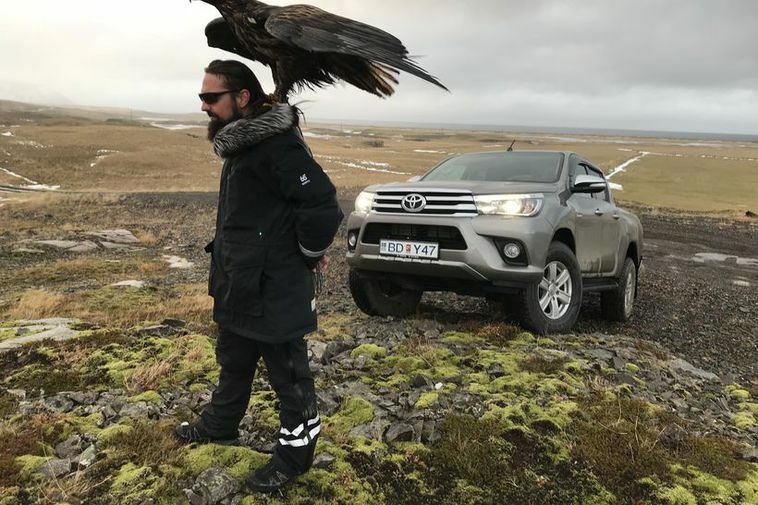 "The eagle is looking pretety good now and there's nothing that points to the fact that has something broken," says Snapchat star Snorri Rafnsson speaking to mbl.is. Rafnsson goes by the name of Vargurinn on Snapchat which means "vermin." Rafnsson caught the eagle in a dramatic rescue last week near Ólafsvík with the help of his father. Since then the bird has been living in a cage with the two man and has been receiving all kinds of delicacies to eat, including liver and guillemot breast. Rafnsson is himself an avid hunter and catches all kinds of wild prey. The eagle was looked at today by Hjalti Viðarsson, a vet in Stykkishólmur who gave him a thorough check up. "There's nothing wrong with his wings," said Rafnsson. "He's regained a lot of energy." Now the plan is to keep the bird calm and to give him plenty to eat and observe his flying when he gets his full strength back. They will be releasing him in a nearby horse training centre to see how his flying ability is. Rafnsson is optimistic about the future. "We're going to enlarge his cage so he can flap about a bit. Of course, there's no cage big enough for a bird like this, only the entire world is big enough for it!"